□ Lightheadedness when standing up and/or dizziness often occur. □ I have experienced syncope on a train, or at a gathering in a school or workplace. □ I easily get tired for some reason. □ I have difficulty getting to sleep and waking up. I usually skip breakfast because I have no appetite in the morning. □ Having a long bath makes me feel sick and weary. □ When I eat noodles, I can’t help drinking up the soup. □ I often get motion sickness. □ I can’t tolerate air conditioning, heat and humidity. □ I often get heat stroke. □ I am suffering from idiopathic pain on my whole body. □ I have been diagnosed with fibromyalgia syndrome. Painkillers don’t work on me. □ I easily become exhausted. I have been diagnosed with chronic fatigue syndrome. □ I am suffering from various symptoms, such as widespread pain, fatigue and sleeplessness. I have been diagnosed with myalgic encephalopathy / chronic fatigue syndrome (ME / CFS). □ I have been diagnosed with multiple chemical sensitivity syndrome. □ I have Parkinson’s disease and/or other disorders of the nervous system. □ I feel nauseous after eating. I sometimes even collapse. □ It is difficult to gain weight though I’m trying to be fat. □ I have been diagnosed anorexic. □ I have been diagnosed with sarcopenia or cachexia. □ I am receiving cancer treatment. / I am a cancer survivor. □ I have been told that I have pituitary or adrenal gland disorders, or adrenal fatigue. □ My schoolwork has been suffering. □ My life is quite stressful. □ My power of concentration is declining, but I like doing things that require a lot of care and attention. □ I have been diagnosed with depression, but antidepressants don’t relieve my symptoms. □ Antidepressants make me feel dizzy. □ I have been diagnosed with panic disorders. I often suffer panic attacks. How many box did you check? If you check more than 5 items, you may have hypotension or hypoglycemia. You should go to see a doctor for a physical examination. To know what causes your symptoms helps your doctor find the right treatment. You can overcome your illness and enrich your life. ◎ Take your blood pressure if you are concerned about your lifestyle. The following are the examples of unhealthy lifestyles. If any of them reminds you of your lifestyle, take your blood pressure. You may have hypotension, orthostatic hypotension or hypo glycemia. Doing exercise helps improve your health. Make healthy lifestyle choices and improve your well-being. ◎ Measure your blood sugar if your blood pressure is normal. If your blood pressure is within a normal range, you may have hypoglycemia. For an accurate diagnosis, an oral glucose tolerance test (OGTT) and continuous blood sugar measuring (Free Style Libre Pro) indispensable. The OGTT test requires you to drink a sweet liquid containing 75g of sugar. You are also asked for blood samples before and after drinking the glucose solution. Blood samples are taken at 30-minute intervals over a period of 3 hours. The test measures the levels of blood glucose, insulin, glucagon, anti-insulin antibody and c-peptide. In fact, many people have hypoglycemia, but they don’t know it. Changing your lifestyle is the first step to treat hypoglycemia. The next step is pharmacotherapy. We have discovered lactic acid bacteria that is particularly effective for hypoglycemia. It helps prevent the overproduction of insulin and the decrease of blood glucose levels. Our treatment has enabled a number of patients to return to normal life and realize their potential. We will help you learn to control your hypoglycemia. You can build a fulfilling life. Various disorders are hidden in the shadow of fibromyalgia. A doctor’s role is to identify what conditions are hidden in a patient. Hypotension (orthostatic hypotension) and hypoglycemia (reactive or functional types) are found in many FMS patients. There are more underlying conditions, including thyroid hormone deficiency (hypothyroidism caused by Hashimoto’s disease) and arteriosclerosis. 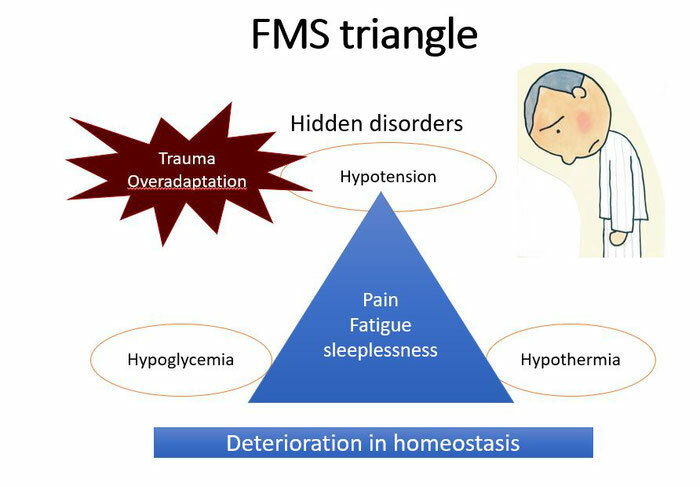 FMS often coexists with hypotension, hypoglycemia and Hashimoto’s disease. These disorders are curable if treated properly. The key is early detection and treatment. Many American veterans have FMS perhaps because of their experience of war and a pang of conscience. In Japan, FMS is sometimes the result of childhood trauma, including bullying, sexual or physical abuse, and parental denial. Memories of traumatic experiences are interpreted psychologically, socially and existentially, and therefore they don’t go away easily. Taking psychoactive medicines does not help much, either. It is psychotherapy, or more specifically, logotherapy that should be used. The Japanese Society of Existential Therapy and International Foundation of Comprehensive Medicine have been training therapists to be logotherapists (RIL) so that they can treat trauma. Our psychotherapists are qualified as logotherapists. They will assist you in dealing with your tauma. Balneotherapy also benefits FMS patients. It helps them recover from trauma and build a new life. They are also encouraged to reflect on their life in such an extraordinary setting as a spa. Unfortunately, we are currently unable to offer a spa where we can practice balneotherapy. 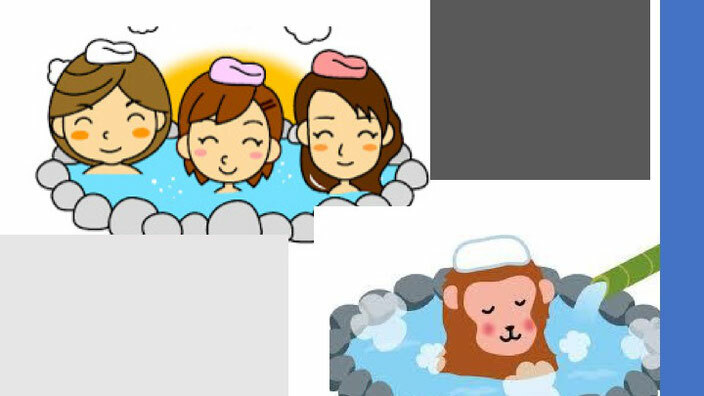 So, we will ask you to find a spa on your own if you wish to try this treatment. We will then carefully look into the spa of your choice. Ask for more information at the clinic. We are here to help you work through trauma. You can be free from pain and make your life more lively.